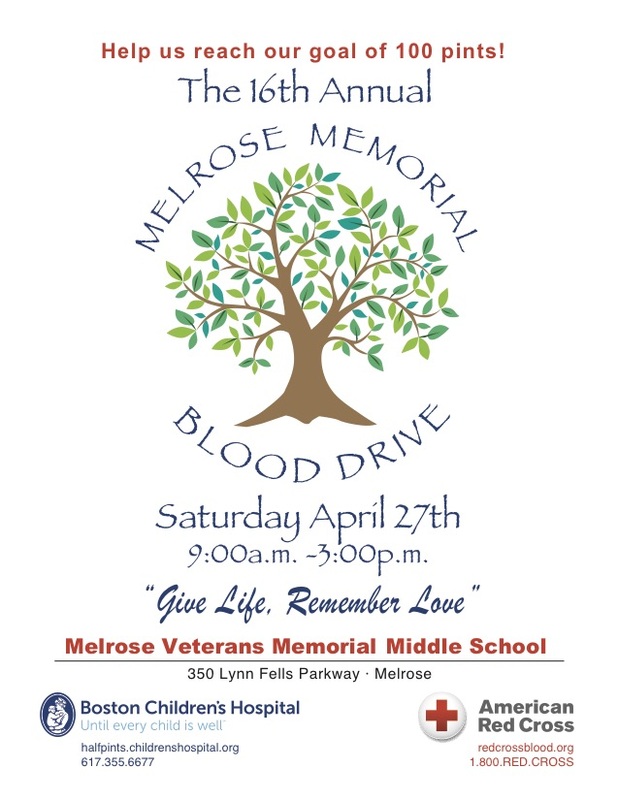 On April 27, 2019, honor those in our community who have lost loved ones by giving blood, the gift of life. The sixteenth annual Memorial Blood Drive “Give Life, Remember Love” will be held from 9 a.m. to 3 p.m. in the Middle School cafeteria. Supplies of all blood types are critically low. Cancer patients, accident survivors, and those fighting chronic diseases rely on life-saving blood transfusions. Every donation makes a difference: one pint of blood can save up to three lives. This year, we have set an ambitious target of 100 units. Help us reach our goal! The event is sponsored by the middle school and high school PTOs, the Red Cross, and Boston Children’s Hospital. Donors over age 17 are encouraged to make an appointment (parental consent is required for 16 year-olds). For Children’s Hospital, log onto halfpints.childrenshospital.org or call Deb at 781-258-4880. For the Red Cross, log onto redcrossblood.org or call 1-800-RED CROSS. Walk-ins are welcome. Positive ID is required to make a donation. Please join us! Melrose comedian, Kevin M. Quigley, brings the very first “Melrose Comedy Event” to the Knights of Columbus this April 26. We sat down with Kevin to learn more. Quigley: I grew up on Orris Street, just a few blocks away from the Roosevelt Elementary School. My friends and I spent most of our free time shooting videos all over town — places like Whip Hill and Sewall Woods — which I’d later edit and animate. When we finally had enough videos to fit into a half hour block, Channel 15 aired them, and many are still kickin’ around on youtube! I guess this was my first venture into writing for stage and screen. Quigley: I had wanted to get into stand-up comedy for a long time and even tried my hand at a few open mic nights during college. But a few years ago, I took a date to Nick’s Comedy Stop, where we saw a talented group of local comedians put on a great show. 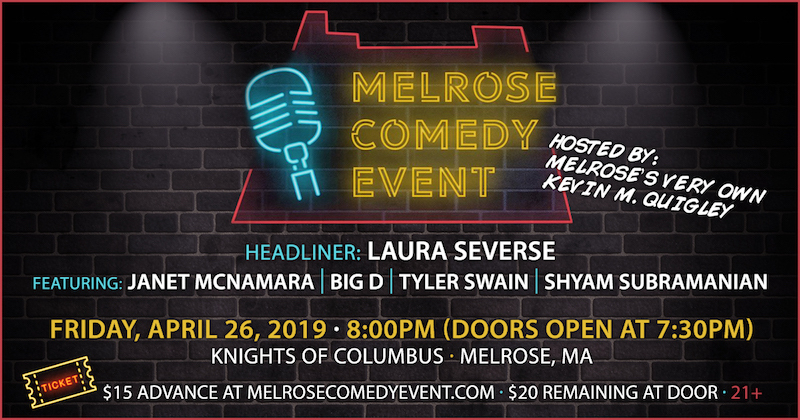 Fittingly, Laura Severse, who will be headlining the upcoming “Melrose Comedy Event,” was hosting that night. Seeing these mostly working-class Boston natives perform gave me inspiration. I knew it wouldn’t be easy, but I realized that since these folks were regular people like me — with lives, jobs, relationships — I had no excuse not to try. And, lucky for me, the girl I was on the date with decided she wasn’t really that into me, so I had plenty of free time! Currently I’m humbly employed as a software-engineer in Boston by day, and perform by night. Q: Where have you performed locally? Quigley: Like most up-and-coming stand-up comedians in Boston, I’ll perform anywhere that offers me stage time. Most notably, I’ve done shows at The Comedy Studio in Somerville, but the bulk of my stage time is through the ‘underground’ network of Boston bar shows, like John Harvard’s in Cambridge, The Pour House in Back Bay, Sixth Gear in Southie, Walnut Street Cafe in Lynn, and a smattering of locations on Cape Cod, in Maine, and in New Hampshire. My most memorable show was a contest at the Cape Verdean Club in Falmouth. Terron Jackson produces a ton of terrific shows down there, and this one was sold out at 130 people. I’d never performed to a room that big, and 130 people is a VERY big room to bomb in front of! My friend, Big D, who is also performing at the upcoming “Melrose Comedy Event,” gave me a great pep talk — I took the stage, did my jokes, and they loved me. Stand-up comedy is a very honest art form. It’s just you — writer, actor, director — and there’s no room for faking it. When you are your true self, the audience will connect. Q: What made you decide to bring a regular comedy event like this to Melrose? Quigley: I have a great amount of Melrose pride, and in turn the people of Melrose have a great sense of humor! I don’t recall many comedy events happening in Melrose when I was growing up, so ultimately I’d like to change that with some reoccurring stand-up shows. Plus Melrose is a vibrant arts community — these shows are a great opportunity to foster and support the comedic arts. I hope to keep the ticket prices low to make attending accessible to everyone, and over time, that the “Melrose Comedy Events” will become a regular place for comedic talent from all over New England to showcase their skills. Eventually I’d love to partner with a local arts non-profit. The first show will be proof of concept, and if things work out, I’ll keep the shows coming — there’s no shortage of stand-up comedic talent in the greater Boston area! And I’m very excited to be able to give local 15-year-old, Sam Rossi, a special spot during the upcoming show. I’m also very jealous, because if i started doing standup when I was 15, I’d probably be really good by now! My mission is to bring stand-up comedy to my hometown, so if I didn’t give our very own young talent a chance to shine, then I’d be missing my own point. Q: Sounds fun! When is the first “Melrose Comedy Event”and where can people get tickets? Quigley: Our first show is Friday April 26, 8:00PM (doors open at 7:30PM), at the Knights of Columbus at 23 West Foster Street in Melrose. I’ll be hosting, and we’ll have acts by Laura Severse (from Nick’s Comedy Stop, CBS Scene, and WGBH), Janet McNamara (from America Idol), Big D (from Sirius XM), Tyler Swain (from Nick’s Comedy Stop), and Shyam Subramanian (from John Harvard’s), plus a special appearance by local Melrosian, Sam Rossi. Purchase your $15 tickets in advance at melrosecomedyevent.com or $20 tickets at the door (21+). Q: What’s the best way for people to follow these events and stay informed? Quigley: ‘Like’ “Melrose Comedy Event” on Facebook to follow along and find out more information. You can also email me at kevin@melrosecomedyevent.com, especially if you are interested in performing or partnering. Did you know Senator Markey nominated the MHS Marching Band to represent the state of Massachusetts in the National Memorial Day Parade in Washington, D.C.? Only ONE high school from each state is nominated! Additionally, the Band has been invited to the State House by State Representative Paul Brodeur in acknowledgment of participation in the National Memorial Day Parade! They are traveling to the State House on Wednesday to perform in the House Chamber during their formal session! 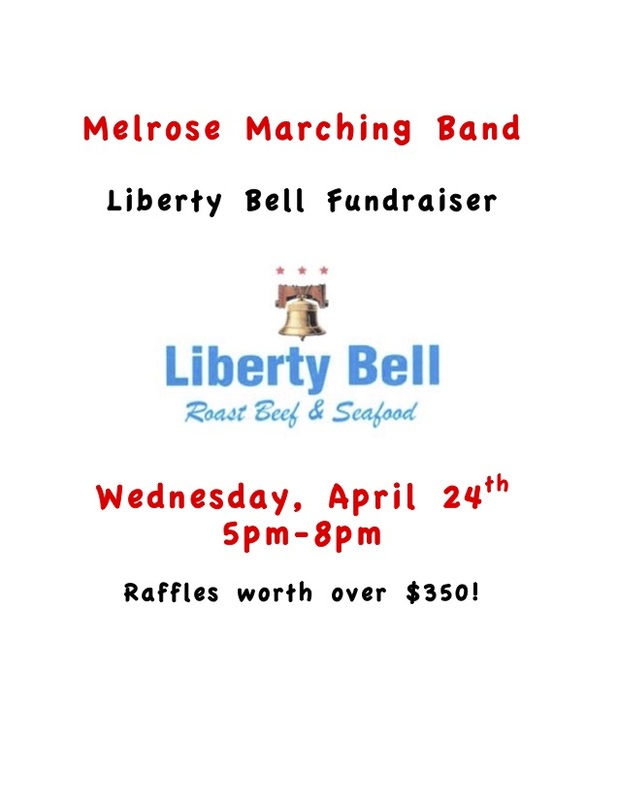 Please come to Liberty Bell on Wednesday, April 24 between 5 -8 pm to help the Band get to D.C. in May! No flyer needed. Take a chance on our huge raffle basket valued at over $350! Thank you for your support! Last month, a developer notified the City of Melrose that they will seek approval to build 9 townhouses, with a total of 44 units, off Swains Pond Avenue. This is what is known as a 40B development, after Chapter 40B, the state statute that allows developers to bypass local regulations if less than 10% of the community’s housing stock is designated as affordable on the state subsidized housing inventory. I want to make you aware of this because there are several opportunities for the public to comment on the proposal as it goes through the various steps of the approval process. The City does not support this proposal as currently configured and has considerable concern about the excessive amount of blasting and land alteration required for such a dense development in an area with steep slopes and vast amounts of ledge. The location is not well served by transit and existing infrastructure and it undermines our proactive efforts in recent years to promote “smart growth” and enhance affordable housing opportunities through thoughtful community planning. We have been clear on our position with the developer and MassHousing since first learning of this proposal and we will reinforce this position in our comment letter. If MassHousing grants a Letter of Eligibility, the developer’s next step will be to apply to the Zoning Board of Appeals for a Comprehensive Permit. The Board of Appeals will hold a public hearing on the project, which will be another opportunity for every member of the public to comment. If the application reaches this step, abutters will be notified by mail and the public will be notified by legal notice in the local paper. All information about this development, including site plans and copies of the application materials, is available on the City of Melrose website. April 21, 2019 at 6:00 A.M. Please join the Melrose Clergy Association for an Ecumenical Easter Sunrise Service at Mt Hood. The service will take place behind the clubhouse. The Reverend Beth Horne will offer the meditation. After worship, you are invited to gather in the club house for refreshments which are provided by Mayor Infurna’s office. Maundy Thursday, April 18th, we share in a union service at the First Congregational Church, 121 West Foster Street. The 7 P.M. service is a musical meditation on the Seven Last Words of Christ. Good Friday, April 19, our Labyrinth with Stations of the Cross is open from 12 noon until 6:00 P.M. The Labyrinth will be set up with Stations of the Cross which provide you with a sensory and symbolic experience of the Passion. Easter Sunday, April 21, begins with an ecumenical sunrise service at 6:00 am led by Melrose clergy at Mt. Hood, followed by a continental breakfast at the clubhouse. Easter service of celebration with Festival Brass at 10:00 a.m. Easter egg hunt to follow in our garden. Great news! 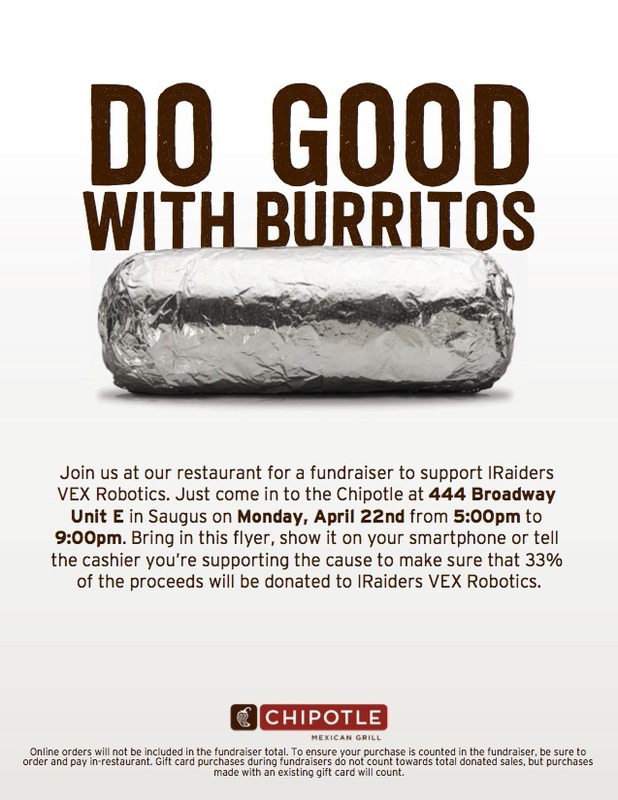 The MVMMS iRaiders VEX robotics team is headed to the VEX World Championships. But, we need your help sending six members to attend the event in Louisville, KY on April 24-April 27, 2019—just two weeks away! The MVMMS iRaiders Middle School chapter consists of three internal teams: A, B, and C. Each team has experienced much growth and success over the course of the season. Most recently the C Bot team won the Southern New England Middle School Regional Championship! This accomplishment prompted an invitation to participate in the VEX World Championship (VWC). Attending VWC offers the opportunity for our members to deepen their STEM learning in robotics, meet peers from around the globe, and strengthen our mentorship skills.